Are Shake Shack’s New Chicken Nuggets Any Good? Shake Shack chicken nuggets are here. This week, Team Shack unveiled its new “innovation kitchen” in Manhattan’s West Village, and the big news is that the menu includes Chick’n Bites, a.k.a. Shack Nugs, which will roll out to other locations around the U.S. next month. It’s a bold move, considering how many other chicken nuggets are already out there. Can these Bites possibly compare to the well-established competition? Grub Street gave them a taste to find out. 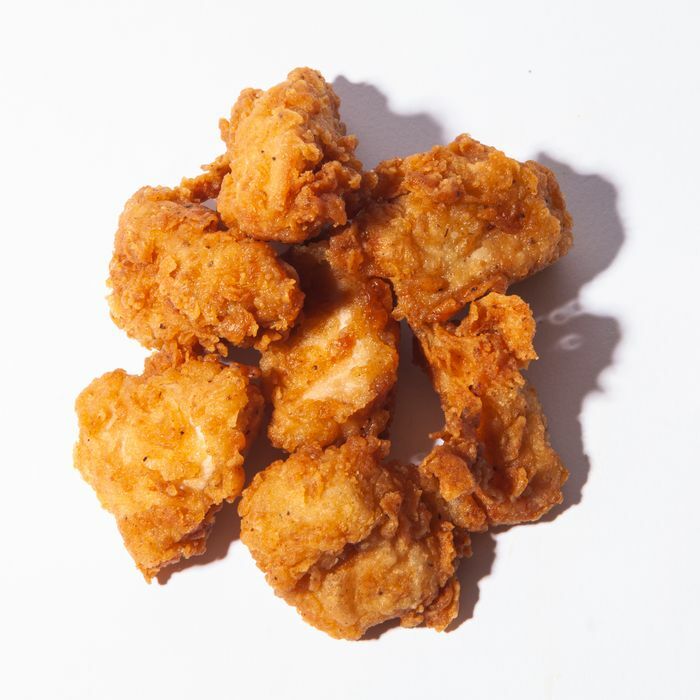 Shake Shack’s nuggets are closest in consistency, size, and shape to Chick-fil-A’s version, and when you break them open, there is actual chicken meat inside, made moist, Team Shack says, via sous-vide cooking before the nuggets are breaded and fried. And the real action is on that breading: These nuggets are stupid crispy. Even the little bready bits that fall off manage to stay crispy. There’s also a nice chili-black-pepper heat that lingers just long enough. Grub Street ate the nuggets in question at a media preview, so it will be interesting to see if Shake Shack can maintain quality once these roll out to more kitchens, but for now, it’s safe to say these Chick’n Bites are a success. Everyone knows that the best part of nuggets is the sauce. You could argue that Chick-fil-A’s entire enterprise is built on the greatness of its Polynesian Sauce and McDonald’s goes so far as to offer two variations on barbecue sauce (in addition to six other sauces). So it’s disappointing that Shake Shack has just two sauces to start. There is, of course, a classic barbecue option — with a nice balance of spice and vinegar — plus honey-mustard sauce that some tasters thought had a nice heat to it, while others thought it lacked the necessary mustard punch. For now, your best bet might be nicely asking your cashier if you can get a cup of Shack Sauce on the side. A six-piece nugget set runs $4.39, while a ten-piece option is $6.39. By comparison, a 12-count order of nuggets from Chick-fil-A is $7.09, and a 10-count at McDonald’s retails for $4.49. Wendy’s, meanwhile, practically gives nuggets away: Its six-piece option is $1.79 and poses the question, How cheap can chicken be before you feel unsafe eating it? The higher price for the Shack Nugs is hardly surprising though, given the chain’s premium leanings. They certainly live up to expectations and, for now, might even be good enough to replace — or at least supplement — Grub’s usual Shack Burger order. Is Shake Shack’s New Veggie Burger Any Good? Can Someone With Normal Cooking Skills Make Superiority Burgers at Home?